We ended up with 80% of our locations in Malta. It was quite extraordinary. I did not expect that! KEVIN REYNOLDS, DIRECTOR, "THE COUNT OF MONTE CRISTO"
The Maltese Islands consist of Malta, Gozo, Comino and two other uninhabited islands. They are situated in the middle of the Mediterranean Sea 93 km from Sicily and 290 km from North Africa. The total area is 316 square kilometres (Malta 246, Gozo 67, Comino 2.7). The longest distance in Malta from the south-east to north-west is about 27 km and the longest distance at its width is 14.5km in an east-westerly direction. The corresponding figures for Gozo are 14.5 km and 7.2 km. The length of the shoreline round Malta is 137 km and round Gozo is 43 km. ​In brief: Mediterranean; Mild, rainy winters; Hot, dry summers. The climate in Malta is generally warm. Rainfall is almost negligible between June and August, where the temperature at that period averages at its highest around 30°C (86° F). The highest temperature ever recorded was 43°C (109.4°F) but these isolated moments are usually short heatwaves lasting for a couple of days only. It does not snow in Malta. Average daily mean temperature range from around 13°C (55.4°F) from December to February, to 26°C (78.8°F) from June to August. Fortunately it is not unusual for temperatures to reach 20°C (68°F) during the winter months. Average hours of daylight range from around as high as 14 hours in summer to as low as 10 hours in the winter. Average sunshine hours range from around 11.5 to 12 hours in summer to 5 to 6 hours in winter. Average rainfall in mm ranges from 3mm in summer to 98mm in winter, with the wettest months being in the following order: November, December, January and then October & September (the latter two being very similar). Fairly reliable weather statistics that match our official data from the national weather station can be found here. There are daily flight connections from major European cities. Most direct and frequent connections (with one or more flights each day) are from London, Rome and Frankfurt. 240 volts-single phase-50 cycles. Three phase is also available in many areas. Malta is a democratic country and the Labour Government (PL) is currently in government. Malta's electorate is finely divided between the Nationalist Party (PN) and the Labour Party (PL), however it is worth noting the latter won the last election with a landslide victory compared to other elections. Elections are held every five years. Malta has become a full member of the European Union on May 1st, 2004. Film insurers have always regarded the country as politically very stable. The government is also film-friendly. Great Britain formally acquired possession of Malta in 1814. The island staunchly supported the UK through both World Wars and remained in the Commonwealth when it became independent in 1964. A decade later Malta became a republic. Since about the mid-1980s, the island has transformed itself into a freight transshipment point, a financial center, and a tourist destination. 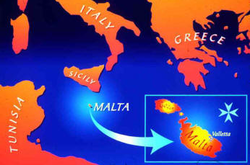 The official languages are Maltese and English. Almost all Maltese speak English. Maltese is a semitic language written in the Roman script, also comprising of a vast number of words of Italian, French and English origin. Italian is also widely spoken. The English language is considered to be a great asset by producers who film in Malta. There are numerous fuel stations open generally between 6 a.m. and 6 p.m. from Monday and Saturday. Only a rare few are open on Sundays, a list of which is published in the local newspapers. When closed, most refilling stations have automated machines operating till midnight. Visa, MasterCard, Eurocheque and other major credit cards are excepted at most leading shops, hotels and restaurants. The cost of 20 per packet is around 4 Euros. Most international brands can be found in Malta. As of April 1st 2004 smoking is banned from many public places which do not have designated smoking areas. Paceville in St. Julians is Malta's Las Vegas. But on a much smaller scale of course! In Paceville you shall find a good number of night-clubs, pubs, restaurants and also a Casino. 112 is a freephone for all types of emergencies (Police, Ambulance, Fire). Malta enjoys a fairly good standard of health care. The General Hospital in Malta is the brand new Matter Dei and there are government health clinics in various towns. There are also a couple of private hospitals on the island. Chemists are open during shop regular hours and one in each town or village is generally open on Sunday mornings. A list of chemists open on Sundays is published in the local newspapers. The local money is the EURO, adopted since January 2008. The total population of the Maltese islands is around 400,000 habitants. Malta's habitants alone total approximately 350,000. Comino has only four habitants with the exception of hotel staff and guests. Malta is very Roman Catholic and one may interestingly note the great number of churches, large and small, on the island. There are more than 300 churches in Malta and Gozo many of which date to the 16th century and have great historical significance. The Maltese Constitution guarantees freedom of worship.There are also churches belonging to various other religious denominations. Being a commonwealth country, cars in Malta are driven on the right side of the road. The greatest speciality is the Roundabout. The vehicle already engaged at the Roundabout has priority. However, most Maltese people ignore road regulations. So be careful - accidents are very frequent in Malta! Should you be unfortunate to have an accident, do not move the car before the police arrive unless it is a bumper to bumper type of accident. Insurance companies may not be very co-operative should you do otherwise. Traffic and road congestion is becoming a concern in Malta as cars increase every year. Shops are usually open between the hours of 9 a.m. and 7 p.m. with a three or four hour lunch break normally starting from around 12.30 p.m. Shops are generally not open on Sundays and Public Holidays, except for Baystreet shops in St. Julians which remain open on Sundays. The main shopping centre is in the city, Valletta, particularly in the main street called Republic Street. Other shopping areas can be found at Sliema too. However, there are a small number of shops in many towns and villages. There are open air markets once a week in most towns and villages. The largest is the Valletta market on Sunday mornings. Also interesting is the fish market at Marsaxlokk also held on Sundays. Taxis can be identified by their all-white livery and are all fitted with meters. Chauffer-driven vehicles controlled from a garage outlet have no "taxi" sign and are usually cheaper than white taxis. These lower cost taxis usually charge 18 to 20 Euros for a 20-25 minute ride. Overseas calls may be made to all parts of the world. The dialing code for outgoing overseas calls from Malta is "00" followed by the countries' code. Malta's international code is "356". The two mobile phone systems utilise a GSM network. Malta has international roaming agreements with many European countries for the use of GSM technology phones. At the moment there are three mobile networks to choose from. There are six cable and terrestrial television stations on the island. Television Malta (TVM) is the national station managed by the Public Broadcasting Services Ltd. The station broadcasts locally-made programmes in Maltese whilst foreign films and documentaries are generally broadcast in English. The advertising market does not support enough all stations' programming and as a result there are several local programmes which are produced on shoe-string budgets. This is rather obvious in the quality of local programming screened on the airwaves. Television airwaves from Italy are received fairly well in the Maltese islands, providing many households with over 12 Italian stations. Cable TV has also been introduced in the early nineties and this provides a wide range of stations from Europe and North America. There are 19 radio stations, most of which are privately owned. Malta time is identical to Central Europe Time which is one hour ahead of GMT in winter and two hours ahead in summer; thus, normally still one hour ahead of UK which is an hour ahead of G.M.T. during summertime. Summer time commences on the third Sunday in March and lasts till the third Sunday in September. No sort of vaccination is required for entry to the Maltese islands. In Malta, one can easily find cars of all ages in various conditions coming mainly from Britain, France, Japan and Korea. The steering is on the right and manual gears are common. The American car model Ford also exists in great abundance. The typically larger American cars are however not available on the island (except from collectors) and drivers would have some difficulty getting them through certain narrow streets or tight corners which are so characteristic of the Maltese islands. Trucks of 40ft in length are not commercially viable on the island. Interesting to note are the old yellow public buses, many of which are still functioning - and running. Trains and subways do not exist in Malta. The most notable "wild" animals in Malta are snakes which are sometimes found in the countryside and which are not poisonous, and rabbits which make the Maltese dish speciality!